BAUEWYK presents the first single from ‘The Good Book Vol 2’ by The Alchemist & Budgie Lifestyle brand and music label BAUEWYK follows up its first collaborative project with producers The Alchemist and Budgie with the 2nd edition of their 2013 project ‘The Good Book’. ‘The Good Book Volume 2’ picks up where the first edition left off with The Alchemist and Budgie sampling purely from religious source material weaving together a bed of production that serves as a perfect backdrop to featured artists Mobb Deep, Royce 5' 9, Westside Gunn & Conway, Action Bronson, Meyhem Lauren, Your Old Droog, Evidence, Remy Banks & more. The double CD / 45 track set is housed in a collector’s edition faux book and will be limited to 2000 pieces. Available for pre-order now. 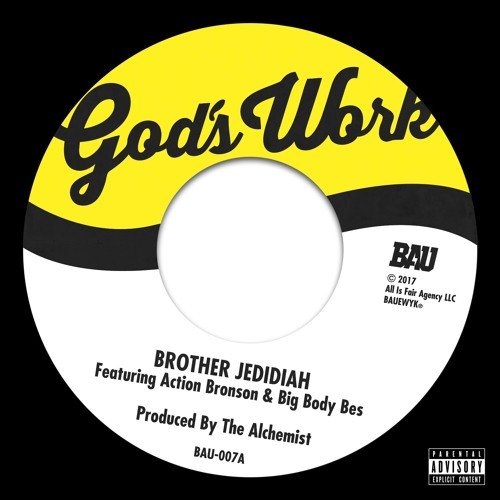 First single is The Alchemist produced ‘Brother Jedidiah’ featuring Action Bronson & Big Body Bes preorder the 45 here: https://chemistryset.myshopify.com/products/the-alchemist-feat-action-bronson-big-body-bes-brother-jedidiah-b-w-instrumental The Alchemist & Budgie 'The Good Book 2' Release Date: July 21st Double CD Containing 45 tracks Featuring: Mobb Deep, Royce 5' 9, Westside Gunn & Conway, Mach Hommy, Meyhem Lauren, Durag Dynasty, Big Twins, Action Bronson, Big Body Bes, Your Old Droog, Evidence, Olivier The 2nd, Jeremiah Jae, Buddy, Emmavie, Chris O'Bannon, Joyce Wright, Jay Worthy, Traffic, Dreebo, Sulaiman, Nyku, Remy Banks, Chuck Inglish, Nasty Nigel & Joyce Wrice. THAT"S A BIG NO! NO! Fire BamBam! we need that new album for the summer though! Users who like Action Bronson & Big Body Bes- "Brother Jedidiah"
Users who reposted Action Bronson & Big Body Bes- "Brother Jedidiah"
Playlists containing Action Bronson & Big Body Bes- "Brother Jedidiah"
More tracks like Action Bronson & Big Body Bes- "Brother Jedidiah"